The bond between a child and a parent is an important and essential one. This applies to the animal kingdom just as much as it does to humans. Unfortunately, tragedy can sometimes strike, leaving baby animals without a mother to care for them. But on the upside, there are hundreds of stories of these babies finding surrogates in the form of animal rescue workers and even other creature. 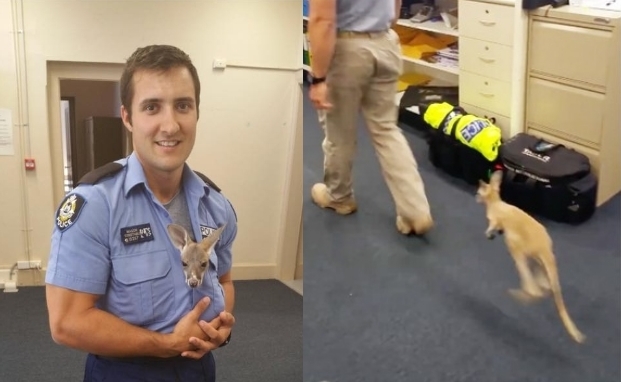 Constable Scott Mason had only been working in the Cue Police Station in Western Australia for a couple of weeks when an adorable baby kangaroo was brought in. Tragically, the kangaroo had lost its mother and was now entirely on its own in the world. But Constable Mason was not going to let this baby go neglected. In fact, he and the kangaroo have formed a heartwarming bond that is sure to put a smile on any animal lover’s face. Scroll through below for a look at this one-of-a-kind human-animal relationship, and then watch the video to see exactly what this baby thinks about his new policeman friend. Responses to "Police Officer Adopts Baby Kangaroo, Lets Him Live Inside His Shirt "